These are today’s finished quilting projects. 5 pillows are being made from blocks found in a trunk filled with WWII things. The lady wanted pillows instead of a quilt so that several family members can have a piece of their history. I decided to let these relax for awhile before finishing. Next I finished the binding on this one. 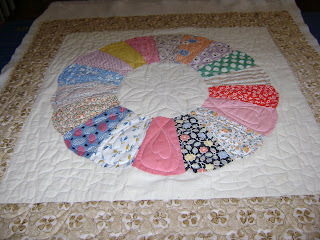 I had completed the quilting back earlier this year before I got behind on my work. It’s also a found treasure. Found when cleaning out the things of the customer’s mother who had passed away. Then I started finishing up this one. It’s also a treasure found by a family member when cleaning out her mother’s things. I always feel happy to be a part of completing the work started by someone and never finished. The saying is…. one person’s UFO is another’s treasure. When I complete quilts for someone who has passed away; I think that maybe the person is looking over my shoulder and applauding my efforts. Maybe they are happy to know their family can enjoy it as a memory of them. Sometimes I’m lucky and all the pieces and instructions are still there. Other times I have to guess at what the original person had in mind. Then there are the times when I have to search through old patterns and books to get an idea of how a quilt would have been finished. Looking through quilt books is fun but sure can eat away at the hours. What’s my point of today’s post? 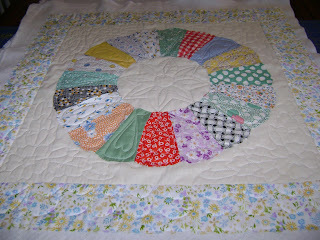 Well I often hear of quilters who believe the family will toss or donate all their quilting stuff after they are gone. 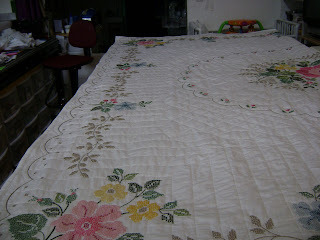 Many quilters are making out a quilter’s will. Certainly, if the person who passes has tons of gadgets and thousands of yards of fabric it will get tossed or donated. But among all those things there is usually one or two ufo projects someone will treasure. I’m one of the lucky people who often get to see what the treasure is and help finish it. 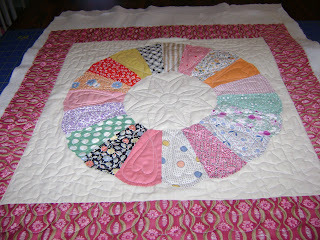 If you are a quilter who starts several projects at one time. Think about storing all the pieces, all the fabrics, and all the instructions in the same bag or box. It will help your family get it finished…. if for some reason you can’t. Time for me to go to work…. 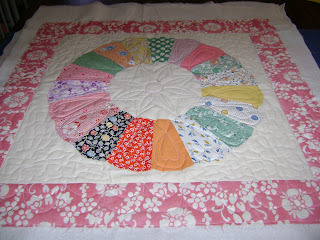 This entry was posted on July 24, 2008 by Anita in QUILTS - CUSTOMER, QUILTS - PIECING, Vintage tops.